Nothing quite kills like kindness — as we have learned once again with the recent atrocity in the French Riviera town of Nice, where a Muslim-piloted truck swept along two kilometres of the famous Promenade, like the scythe of the Grim Reaper, taking over 80 lives. 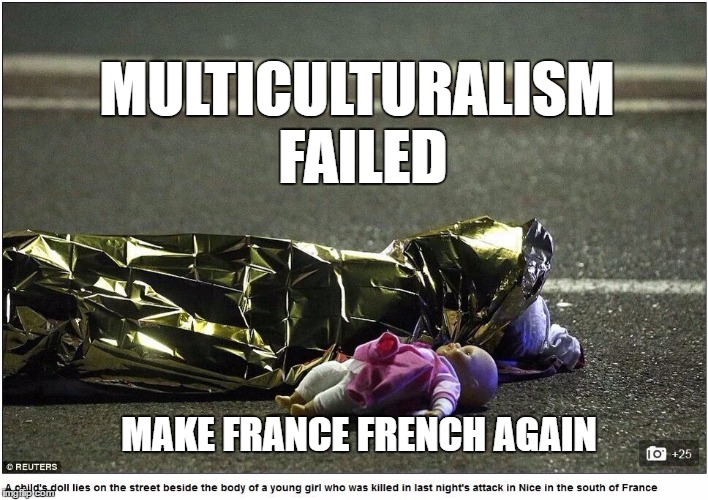 After Charlie Hebdo, the massacre at the Bataclan Theatre, and other attacks committed by Muslims against French people, one could well ask, what are these people still doing in France, let alone being allowed access to juggernauts of death to mow down men, women, and children? Adding to the sense of the surreal, was the mysterious fire at the Eiffel Tower — I mean, it’s little hard to light that up in a show sympathy for Nice when it is choked with black smoke (a suitable metaphor for the way non-white immigration has clogged up France). Once again, the main sensation one feels is a sense of wonder at the overwhelming kindness of Western people in allowing alien and hostile elements into their countries and then taking them off the leash, without bothering to ascertain the degree of their spiritual and cultural rabies. As I write this, we are now between the “should I or shouldn’t I put a French flag filter on my Facebook picture” phase — I guess many won’t bother this time as it hasn’t done much good — and the lighting up off some prominent building in symbolic colours of hope. As the red, white, and blue of the tricolour have been greatly overused, other colours will have to be found, perhaps derived from the events of the tragedy. Let’s see — maybe someone in a yellow mankini or purple beach thong lay down his life by pushing a fellow fireworks spectator out of the path of the wheels of death. How wonderful if that person could also happen to be Muslim! But whether they find such a person or even a suitable colour or two to wash over some hapless building that isn’t on fire, we can certainly expect the Naxalters to be out in force as usual. But please try not to be too unkind to them. Remember, not all Naxalters are like this. As our anticipation of apologists reveals, the real tragedy of Nice is not the 80 + lives and the hundreds injured, but our all-too-convenient ability to emotionally vent (thanks social media!) combined with our collective inability to learn a lesson from these kinds of events. Some of you have probably seen the meme of a cyclic chart that goes from terrorist atrocity to “Pray For . . .” hashtag, through Facebook flag filters, and back to terrorist atrocity again. What good will come out of this latest attack? Will we do anything differently this time? Is the establishment starting to realize that they are going round in circles and losing increasing amounts of credibility, adding to the fragility in the system? Right now, all the emotions are a-stir. Things are being said, articles written — including this one — but where does any of this go in practical terms? Only the Alt-Right and White Nationalists have any real solutions, but we are, as yet, too few to dictate events and implement the solutions we so clearly see — namely redefining France from a vacuous proposition nation to a positive identitarian White European state, antithetical to Islam and other foreign and hostile elements. But, despite our marginalization, there is also the possibility that the great mass of the French people, and indeed its government and elites, may feel the need to do something different this time. After all, it’s clear that all that praying for former atrocity sites and the much-mocked shot of politicians walking arm-in-arm down some boulevard to show “solidarity” did not achieve anything, except perhaps reminding Brexit voters that leaving Europe was the least dangerous move. Perhaps, finally, after being so long on the receiving end there is a hunger for action among the French. But, if so, what form is it likely to take? What are the options for “normie” politicians, constrained by the maxim that politics is the art of the possible and the realization that not much is possible in a kitchen where nobody dares to break an egg? The easiest thing for them to do, is to do what they have already been doing – namely prosecuting a few more “hate” preachers, shutting down a token mosque or two — while green lighting the building of hundreds more. Or maybe, if there’s a real swell of anguish and grim determination behind them, they might consider tackling the thorny question of the Zones Urbaines Sensibles, the “sensitive urban zones,” that winning euphemism for the hundreds of no-go areas dotted round France, where Whites can be beaten up at will and where the police have to get permission from Muslim “community leaders” in order to enter. As necessary as it is to tackle this problem, I suspect the will to do so is not quite there yet, especially as any government attempting to do so would have to wade knee-deep through “blood and snotters” and months of riotous clashes before being able to show timid voters any achievements. With French presidential elections coming next year, now is not the time to unleash this kind of mid-level anarchy. Tackling the Zones will have to wait for a Front National government with a particularly strong mandate, and even then I wouldn’t expect too much from these civic nationalists. If a gesture is needed, perhaps something could be done about Europe’s refugee influx. 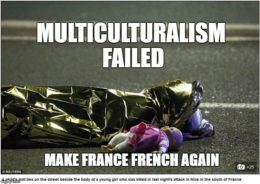 Maybe France can “do a Poland” and simply say that it will not take any of Angela Merkel’s little brown darlings. Or maybe the EU bigwigs can huddle and put together a raft of ideas to stop the raft of human debris washing up on Europe’s shores. But, things being what they are, we can’t expect much to happen here, especially if it involves getting a little nasty and accidentally damaging some poor migrant’s smart phone on the way over. Given the difficulties, the establishment may just hang fast and hope that it all blows over, especially as the Olympics are just round the corner and there is a fairly good chance of something chaotic happening there as well. But the Olympics won’t last forever, and when that festival of sport and dopery has come and gone, we’ll soon find ourselves in a situation similar to today’s, with fresh carnage and feelings of rage and restlessness. Perhaps the easiest option and even the most politically acceptable for the French government would be to take the battle to ISIS — i.e. externalize what is in fact an internal problem. French military action — i.e., boots on the ground rather than fly-overs — could even pay dividends. ISIS is clearly inspiring these terrorist attacks in France, but it is also militarily weak — at least in the conventional sense. Its success is largely dependent upon the equal ineptitude of its opponents. Faced by a real military force, it would fall apart in days. But although the French could easily defeat ISIS militarily, controlling the area that spawned ISIS would be a different proposition. Once again, the Western propensity to be nice hamstrings them. To control the Sunni Crescent, which stretches from Baghdad to Damascus, you need to use the kind of brutality that only the likes of Saddam Hussein and Hafez al-Assad — or literally Hitler — were capable of. The army of a modern, social democratic state, like France, is morally ill equipped to do the dirty work necessary to restore order to that Allah-forsaken hell hole. For French military intervention to mean something, you would have to have a suitable follow-up plan. The only one that makes any kind of sense would be to come to an arrangement with the various parties in the region who would benefit from ISIS’s demise. There are three main ones, namely the Assad regime in Syria, the Shiite government in Iraq, and the Kurds. While all three could be helpful, the most useful would be the Assad regime, because the main power base and capital city of the ISIS caliphate is in Syria. Any attempt to effectively destroy ISIS and prevent something like it from rising again would have to involve Assad. But, more importantly, it would also have to be an effective endorsement of the kind of ideology still embodied in that regime, namely the secular nationalist and socialist mixture known as Baathism. This force successfully controlled the region for several decades, while there is absolutely no evidence that Western-style democracy ever could. Baathism, despite its many flaws, is therefore the best bet to control the kind of Islamism that can inspire attacks on French soil. For France to tacitly support such a solution, however, it would not only have to turn a blind eye to the occasionally heavy-handed techniques employed by the Assad regime, but it would also have to give up any naive democratic notions. In that part of the world, democracy invariably serves to let the Islamist genie out of the bottle, with disastrous effects. Quite simply, to have a healthy ground game against ISIS, France would have to reverse the policy the West has followed since the 1950s, of opposing secular and fascistic Arab nationalism. Something like this would be deeply troubling to Israel, which obviously prefers chaos on its borders, as well as to France’s own powerful Jewish community. For this reason, if France finally decides to thump its chest by sending in its formidable military, it will probably choose not to cooperate with Assad. Instead, it might try to set up a pseudo-democratic Syrian “Vichy government” in whichever part of Syria it chooses to occupy, before leaving soon afterwards in a cloud of dust. The effect of all this on the French Muslim population at home can only be imagined. So, all things considered, the do-nothing-besides-a-few-empty-gestures approach will remain the most appealing to France’s ruling elites. But one can’t do nothing forever. Eventually and ultimately the time will come to break eggs, crack heads, and get nasty. When that happens, events in far-off Syria will be an irrelevance.